» Pay as you go! The growth of every business leads to the increase in data and after certain limits, it becomes difficult to handle the IT infrastructure that is related to sensitive data. CloudWays is a reputed company offering customized cloud application deployment that enables the customers to manage their existing cloud infrastructure or start a new one. Cloudways help the users to deploy 100+ open source applications and includes complete migration to the cloud setup, security patching, technical advice, backup control, monitoring for uninterrupted cloud experience and etc. 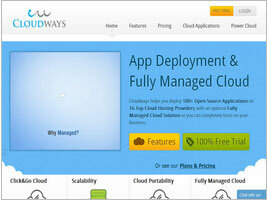 When it comes to affordable cloud solutions, CloudWays is the only name that comes to the mind. The company caters to specific requirement individually and makes easy for any online business to migrate to cloud computing services. It offers the customers a well-managed cloud platform that includes customized applications, high availability, managed backup etc and enables the potential customers to select the best plans based on their needs. Power Cloud: it is designed to meet the needs of large scale databases or websites requiring an automation process and data security and reliability for business critical operations and optimum performance of the site. Click&Go Cloud: this product offers easy to use or single click applications deployment to top IaaS providers. The customers can enjoy 100+ applications and these applications can be productivity tools, developer’s or business tools or CMS, CRM or LMS. CloudWays offers various unique and flexible cloud services to the clients and it is due to its reliability, affordability that the company enjoys a strong clientele base in Europe and Asia.